The coin corresponds to the description at number 1 in the Moushmov catalog. The issue of local coins began in Dacia in 246/247. At that time emperor Philip the Arab granted the right to strike coins in Dacia. The last provincial coins were struck in 255/257, with AN XI in exergue. 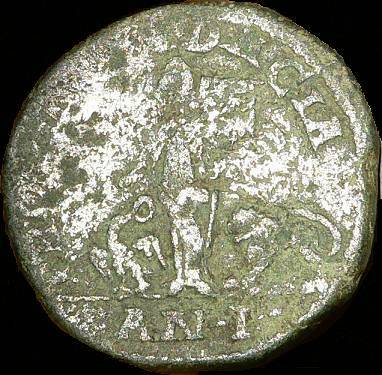 The inscription AN V in exergue shows that the coin was struck in 246-247. The presence of the eagle and the lion on local coins, symbols of the Dacian legions, is a homage to the Roman armies garrisoned in the province. The propagandistic message is clear enough: the liberty in the province (Dacia wears the Phrygian cap or pileus, sign of freedom) was obtained after the victories of the Roman armies stationed in Dacia. The real name of Philip the Arab was Marcus Iulius Philippus. The surname "the Arab" refer to the emperor ethnical origin. His wife was Marcia Otacilia Severa. 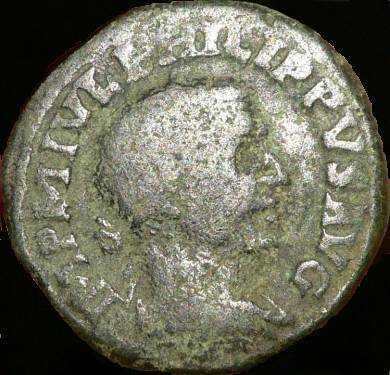 In 244 Philip the Arab became emperor of Rome, after the death of Gordian III. In 248 AD Philip patronaged the feasts of the millennium of Rome's founding. Historia Augusta (Gordian, XXXIII) shows that at the celebrations organized in April 248 a lot of wild and tamed beasts, as elephants, tigers, lions, leopards, hyenas, giraffes, hippopotami, and even a rhinoceros were employed. Several of these animals are represented on the coins issued for the millennium celebration. In the spring of 249 AD the Danubian legions proclaimed Traianus Decius as emperor. The rebellion succeeded and in the battle of Verona in Italy Philip the Arab lost his life.